Police brutality and racial prejudice has once again become the topic of discussion in the U.S. recently with the controversial stop and frisk practices in New York often targeting Blacks and Latinos, as well as the horrific aftermath of the shooting of an unarmed Black teen by a White cop in Ferguson, Missouri -- which sparked a national discussion on Twitter and beyond. But in our ongoing conversation about these serious events, we often neglect to discuss how other marginalized races in America have been affected by police injustice. Which is what makes a film like REVENGE OF THE GREEN DRAGONS so relevant right now. It goes beyond the story of the rise of the prominent Chinese gang in New York City 1980s by exposing how a virtual war was brewing right underneath the noses of the NYPD without so much of an acknowledgement. The notion is--and the gang is very savvy about this--as long as the crimes only involved other Asian gangs or victims, police won't pay them any mind. In short, murder became legal as long as it was acted against their own kind. It's a bold statement which still reflects today's society, sadly. Directors Wai-keung Lau (Infernal Affairs) and Andrew Loo take on the enormous task of not only bringing to light a buried truth in this country but also illuminating this story through the eyes of a generally unknown cast--in a way that resonates and rises up to the level of classic modern gangster films. While executive producer Martin Scorsese's (who remade Infernal Affairs with The Departed) influence is sure to be found in pockets of the film (especially when it the tone shifts between hyper violence and petty romance), Lau and Loo (the latter who co-wrote the film with Michael Di Jiacomo) definitely have a heavy hand when it comes to the execution of each scene and the persistent slow-motion shots. 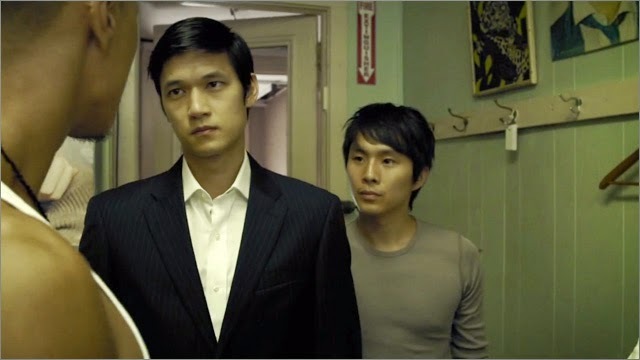 What also stands out in the film is, of course, the riveting story that follows Sonny (Justin Chon) from the meek adopted son of a Chinese restaurant worker to becoming one of the biggest threats in the gang. Coincidentally, we only see him actually kill someone once, as a child in the initiation stage who's brought in to finish a guy who originally pegged as his friend's target. While the two, childhood friends and brothers in the truest sense, rise up the ranks of the gang it is Sonny who sees beyond the crew while his friend Steven (Kevin Wu) sees his alliance with the gang as an inevitable means to an end--one which fills him with as much power as dread. With a feeble romance between Sonny and Tina (Shuya Chang) waiting in the wings, the friends must contend with dangerous head honcho Paul Wong (Harry Shum Jr.), irresponsible law enforcement led by Ray Liotta's Detective Bloom, and their own fates. Chon and Wu, with Shum, hold their own on screen as the main characters in the film, but Eugenia Yuan as a fierce puppet master commands each of the few scenes she's in with even just a rise of an eyebrow. With a ending you'll never see coming, REVENGE OF THE GREEN DRAGONS is a solid crime drama that presents an alternative to the typical American gangster film often about a white man wreaking havoc. Lau and Loo are forces to be reckoned with. Your move, Scorsese.